Meissen has the longest unbroken history of any European porcelain manufactory, building as it did on its primacy in the field, and an unyielding quality control that has resulted in an output unrivalled by any other. So as the saying goes "if it isn't broke, don't fix it". 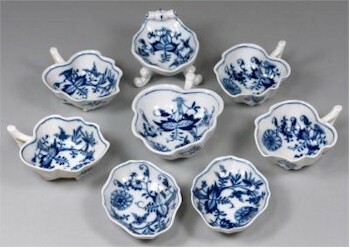 A group of Meissen butter boats and salts in the Onion pattern. Whilst I am sure that Meissen continue to produce new and innovative models and ranges of dinnerware, very little novel output occurred after the first few decades of the 20th century. Instead what we do see is the traditional and time tested reissues of the popular 18th century models originally designed by Kaendler, Acier, Eberlain and Schonheit and likewise for 19th century pieces by Leuteritz, Spieler and Schott. A Meissen 20th century re-issue of an 18th century original by Acier. Whilst there are obvious difference in the factory marks and some evolution in glazes and enamels, the otherwise perennial tableware patterns such as the Onion pattern, Immortelle and Indian are still in production, along with countless figures, perhaps the most common being the Crie de Paris (Street Trader) figures and the humorous 'so called' Monkey Band figures and those from the Commedia dell' Arte (Italian Comedy) series. 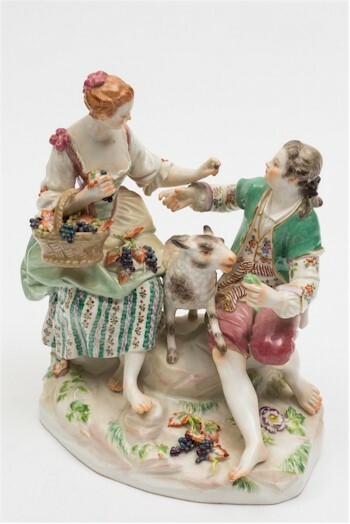 Ever popular Meissen figures including Italian Comdey, Monkey Band and 'Cries' figures. One might be disparaging and say that Meissen hasn't produced a new idea in a century, but when you have the lineage and back catalogue that they have, why would they? Both the prices paid for new pieces and those on the resale market speak for themselves. 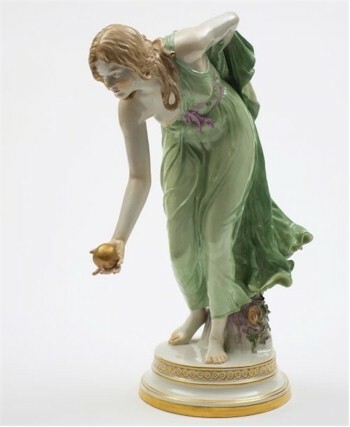 A Meissen figure, circa 1900, of The Bowler modelled by Walter Schott.